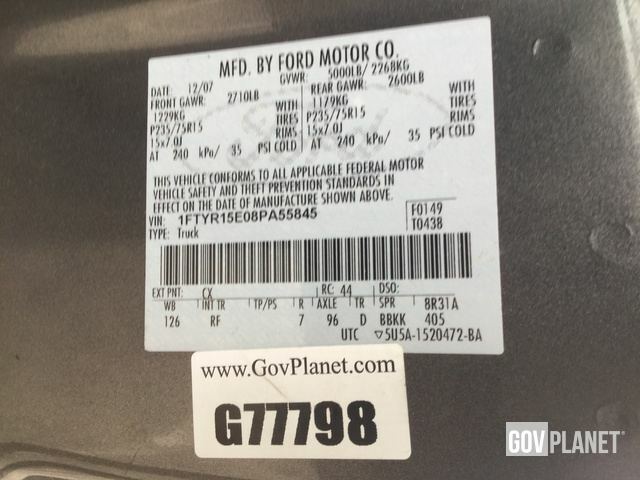 Serial Number / VIN 1FTYR15E08PA55845 Click here to open photos and videos of this item. Odometer 131,352 Miles - IronPlanet makes no guarantees as to actual hours/miles; we can only report what can be visually observed. Click here to open photos and videos of this item. A/C Compressor Not operationally checked Click here to open photos and videos of this item. Limited Function Check (Engine) After jump starting, the engine ran. The engine would not re-start after shutting down without jump starting. Click here to open photos and videos of this item. Limited Function Check The transmission shifts hard and took a significant amount of revving in order to move. Steering Components Rust Click here to open photos and videos of this item. Suspension Condition Rust Click here to open photos and videos of this item. Bed Cover Click here to open photos and videos of this item. You must call at least 24 hours in advance to schedule pickup; removal is by appointment only: Mon-Fri 9AM-11AM, 1PM-2PM ONLY. Item must be removed 4-7 days with appointment after sale date due to limited space on-site. No exceptions.